The Scrap Happy Throw is coming along. If you remember I started this as an easy project I could take with me whilst travelling to Egypt. Great to make on the plane and anytime I did not want to have to think about what I was doing. It is a great project for using up all sorts of scraps of yarn of all different weights – all tied together with a Reef Knot. I will be leaving the ends on show. I am making it as a throw to protect a kitchen armchair (not this one) in my daughter’s new house. Perfect for her farmer husband to sit in when he comes in for lunch covered in farm grime. It needs about 10 more rows before adding a one coloured edge. I have also just completed a little 6″x6″ cotton doily as a housewarming present for a friend. Made with a 2mm hook in Scheepjes Sugar Rush crochet cotton, Capri Blue. This is the second time I have made this pattern – it is not the easiest to follow, I probably won’t make it again. I’m joining in with Ginny and other Yarny Crafters in Ginny’s Yarn Along. I’m not reading any books but I am listening to The Horn Section on Radio 4 Extra . A peek at the corner of the Rainbow Amanzi Throw I’m making for my 8 year old granddaughter. Her birthday is in April, I think I will have it finished by then. 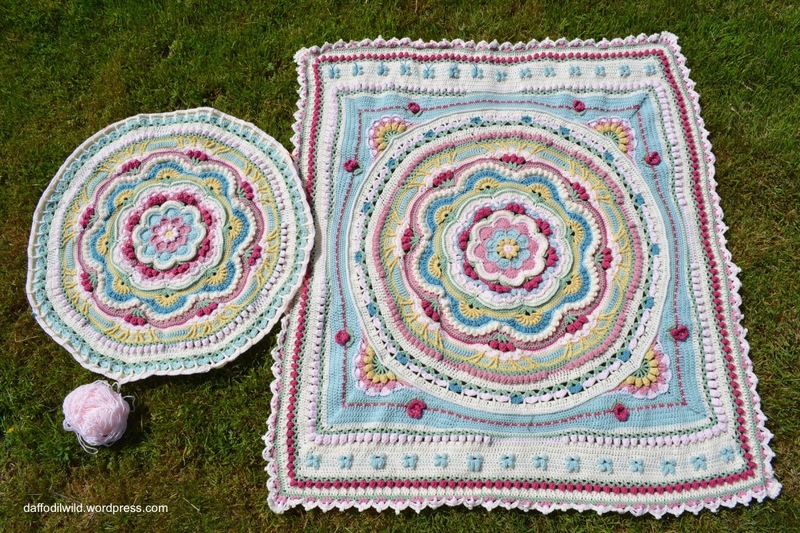 Anyone who knows the pattern will see that I have made some modifications – Jen Tyler’s designs encourage experimentation! I’m enjoying these lively colours in the depths of Winter amd to offset the ‘noise’, I’m enjoying revisiting the book “Returning to Silence”. It was published in 1988, I first read it, and loved it, in 1998 and now I’m enjoying it again. Like so many similar books, it is about coming back to the self, being present in the moment, knowing your peaceful centre, no matter what you are doing. I like the way it soothes me and takes me there again. Meanwhile I keep crocheting these bright zingy colours! I have SO enjoyed making this blanket. I usually have 3 main projects on the go at any one time. One that is Work, one for Rest and one for Play. This has been my ‘Rest’ blanket that I have been making when I need a break from complicated patterns that require focus and concentration like the Karoo Vintage Mystery Along (a Play project) and the Dreamcatchers. (Work projects as they had to be done by a certain date). I have made this ‘Land, Sea and Sky Blanket’ in odd moments, in the evenings, whilst waiting for appointments, when I have felt too tired to do anything else and when I’m out and about with the grandchildren. Lucy’s Cosy Stripe Pattern is the most relaxing pattern to make, with just enough interest so that it does not become boring and stitches (double crochet -US) I can do without looking at it for a lot of the time. From the left the stripes start with sky, then go to sea, sand, land, sky, sea, sand, land, sky. I made up the sequence and colour choices as I went along. Mostly made in Stylecraft Special DK yarn with a 4.5mm hook. and a variegated yarn and pale turquoise from my stash that I had used in this blanket. This is the sort of project I make when doing other things, so it takes no time at all and is using yarn from the stockpile in my loft. I’m sad to see it come to an end as now I have to do the edging and finish sewing in the ends, so it will briefly fall into the ‘Work’ category. It has been a delight. Joining in with Ginny’s Yarn Along . Ginny asks us to include a book we are reading. I rarely read nowadays but I do listen to a lot of Comedy and Drama on Radio 4 Extra which I believe is possible to access from other countries. This is a nice bit of silliness: Revolting People by Andy Hamilton. Jen Tyler of Hooks ‘n’ Tails is another fabulously creative crochet designer. but so worth it if you can cast pre-conceived ideas to the wind and go with her! This pattern is a Mystery even to Jen herself, she is making it up as she goes along and each week gives us another few rows to work on. The pattern starts with a flower and then We’re OFF! on a voyage of discovery. Texture, overlay and all sorts of avant garde instructions follow. If it were not for the videos, I don’t think I would ever be able to follow the patterns. They are clear and well written but the stitches and methods of achieving them are unconventional, often taking a bit of working out and it makes my head spin. Even the videos are not easy to follow. They are not tutorial videos, but more Jen racing along with her crochet hook and me scampering behind trying hard to keep up! Sometimes I re-play the video 4 or five times to work things out. I have just arrived at the end of Part 3 and it measures 67cm (26″) square. 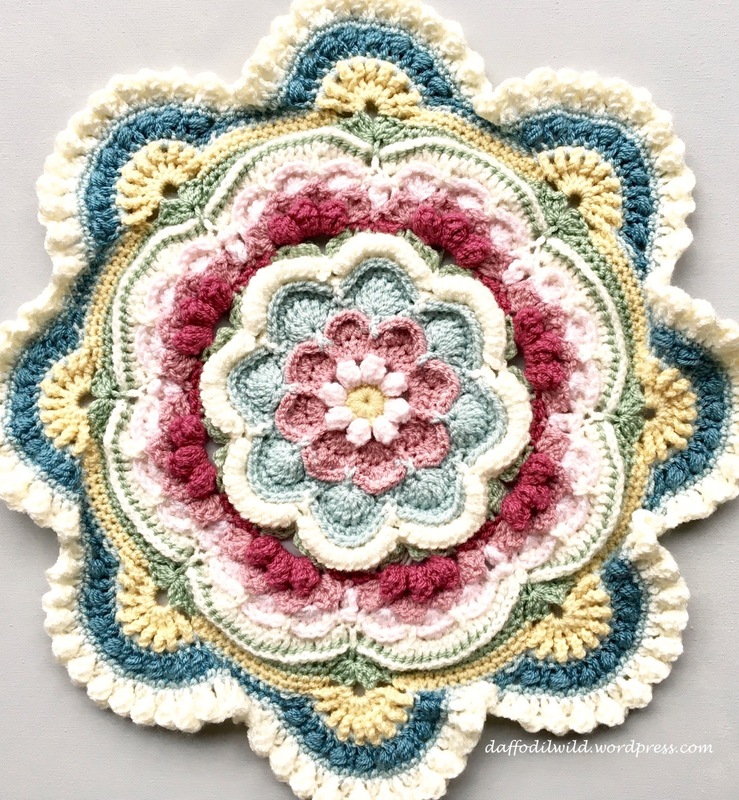 This project is like going on a Crochet Safari – you have to keep your wits about you and you never know what exciting new experience is round the next corner. It is fun! And I have to concentrate so hard that all other worries melt away for hours on end – so therefore it also gets to be relaxing. 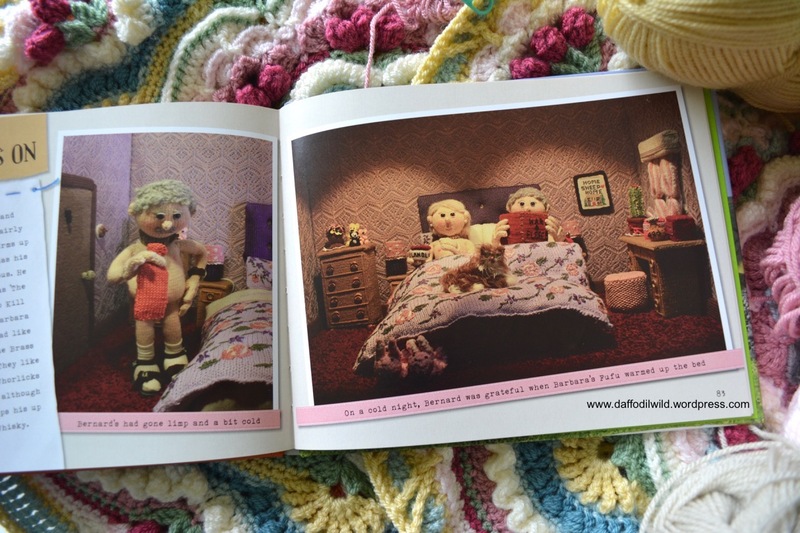 If you want a crochet adventure, this is definitely the right pattern for you! There are plenty of other brave explorers who have picked up the challenge and you can see all their amazing work on Instagram, Facebook and Ravelry. 4.5mm hook and Stylecraft Special DK in woodland colours. I loved working with Woodland colours for my Woodland Ripple so much, I was just waiting for another project in which I could use them again. Joining in with Ginny’s monthly Yarn Along. I rarely read books nowadays but I do listen to stories and dramas on the Radio whilst I crochet and The Little Ottleys has been a delight to listen to whilst going on safari in the Karoo. The Rosslyns are coming along. It is fun to make the same pattern in the same colours but in a different order. I’m not totally sold on the pale pink (Soft peach) rows in the one on the left – what do you think? It might look better when I have done a few more rounds. I don’t like how the ‘roses’ turned out in the one on the right so I will be making some flowers to sew on for the other one. Ginny likes us to add the book we are currently reading, but as you may know I hardly ever read fiction nowadays. I do however love to listen to the Radio whilst crafting and am really enjoying the new comedy on BBC Radio 4, ‘Ground Control’, starring Tamsin Greig. 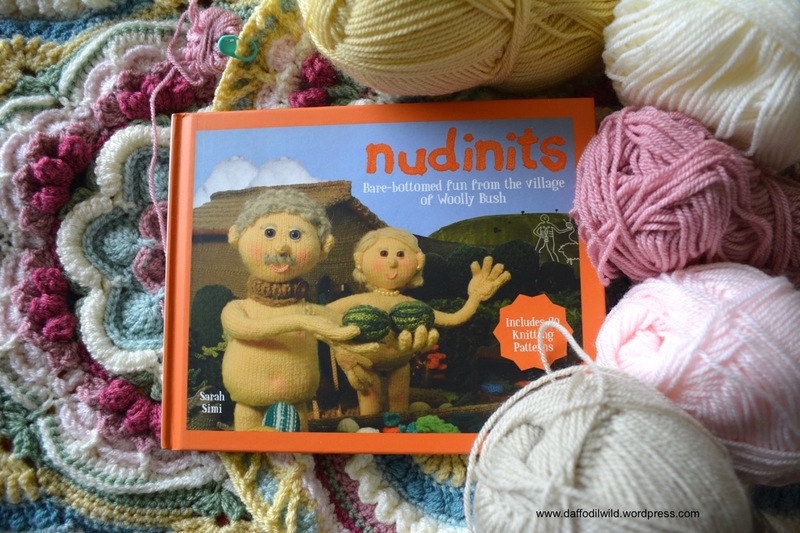 I love Ginny’s Yarn Along – a chance to meet up with other yarn lovers and see what they are making and what they are reading. 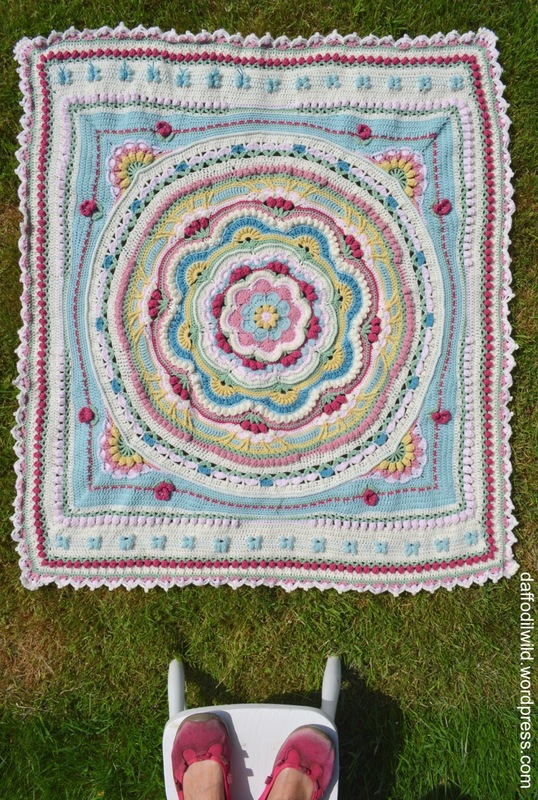 A paid for pattern by Helen Shrimpton. 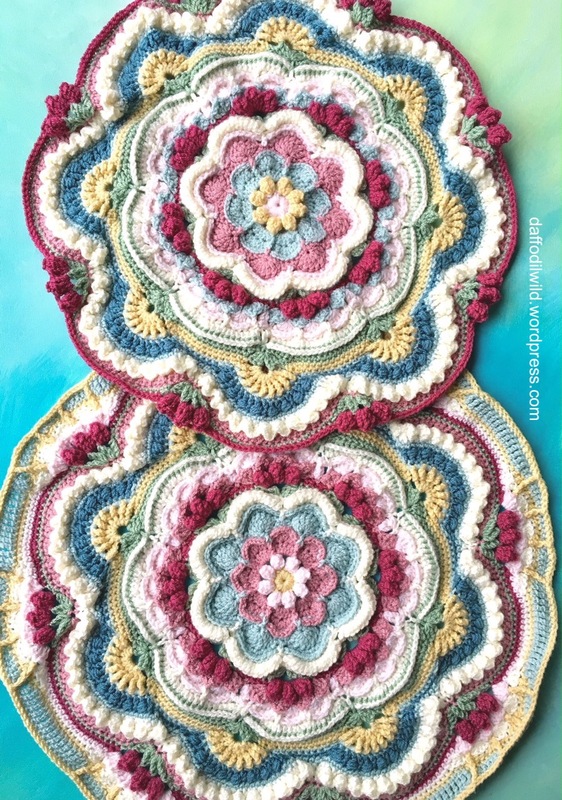 This is a really lovely relaxing pattern to make and just the thing to be making alongside the current Cosmic Cal. I usually finish the rows given for the Cosmic Cal a few days before we are given our next set of instructions, so I then move to working on the Rosslyns. 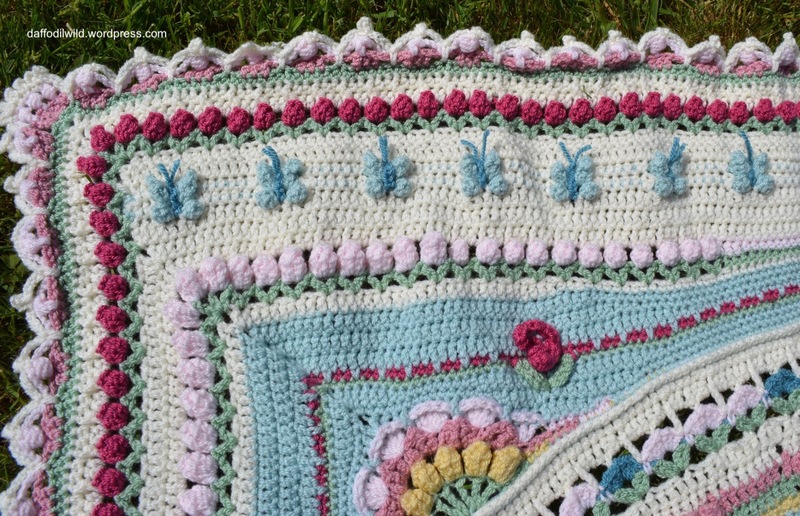 and now I have also added some butterflies – pattern by Debbie Dearest. My intention was to make a single bedspread, as a birthday present for each of my twin granddaughters (they will be 6 in October). The butterflies were there to make the finished bedspread rectangular rather than square. Yes, that looked fine so I made the edging and finished one, with just the butterfly bodies to complete and ends to sew in. This means they will be lap blankets instead of bedspreads but they can still go on their beds. Do you listen to the radio or podcasts whilst crafting? If so I’d love to know which ones. Photo taken with my iPhone, it looks a bit harsh as if made of cotton, but it is in Stylecraft Special DK, made with a 4.5mm hook. Buttermilk, Soft Peach, Pale Rose, Duck Egg, Cream, Lincoln, Raspberry …….. Storm. This is a wonderful pattern to work with. A pattern I will be happy to make twice as I am making one for Twig and one for Twiglet, my 5 year old twin Granddaughters. I’m loving the way the characters of each of my 8 grandchildren are reflected in the colours and patterns of their blankets. I have already made 4. The first was Miss E’s daisies . 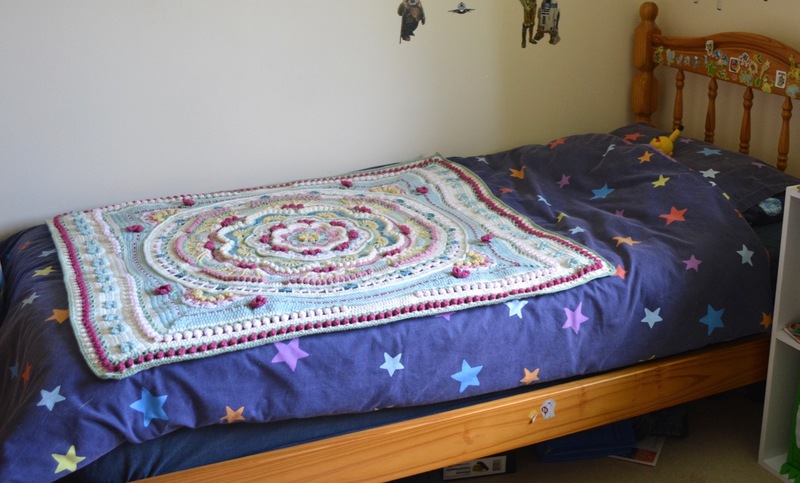 To see the finished blanket go to the Throws Page and scroll down through links to other blankets and throws I have made. I loved the books by Diana Gabaldon in the days when I did read fiction, now I’m enjoying the emotional rollercoaster of the DVDs. There is a mass of Outlander knitting pattern sites on Etsy .